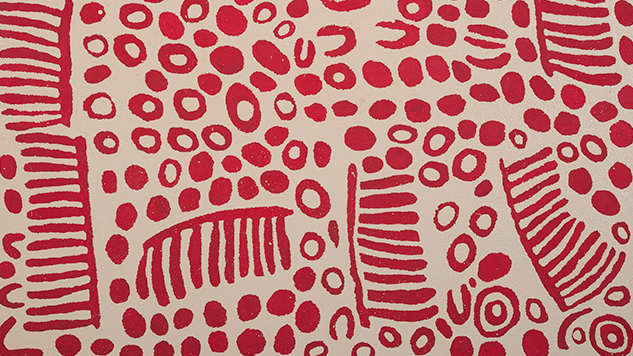 While Aboriginal Australian art is revered on the island continent, the practice is not well known in North America. Skerritt hopes that will change with the exhibition Marking the Infinite, which features never-before-seen artwork from nine female artists who have shaped the movement. The rolling exhibition opened the second leg of its tour on January 28 at the Patricia and Phillip Frost Art Museum FIU in Miami, Florida, and will run at the space through May 7. There’s been a great deal of controversy surrounding fake Indigenous Art as of late, so a show celebrating the rich, authentic history behind true Aboriginal artists couldn’t be more timely. In many ways, Marking the Infinite is a political statement. On the surface, the exhibition uses bold artwork to draw attention to a vibrant art scene thousands of miles away. But these Aboriginal women are also creating art to ensure their language, their country and their way of seeing the world survives in an increasingly digital world. Like Yunupingu, Regina Pilawuk Wilson hails from Australia’s Northern Territory. She’s an award-winning artist known for her large syaw — meaning fishnet — paintings. For Marking the Infinite, Wilson produced her two largest artworks to-date, which gives testament to her sheer ambition as an artist, says Skerritt. In fact, Wilson’s piece, “Sun Mat,” serves as the cover of the catalogue for Marking the Infinite. The painting is a spiraling kaleidoscope of blues, reds, oranges, purples and pinks that reaches about 9-feet tall and stretches about 12-feet wide. “It’s a beautiful, gigantic painting,” says Scholl. Both Skerritt and Scholl consider Carlene West’s artwork among the most powerful in the exhibition. West, who lives in Australia’s Southern Desert region, had a “short but sharp” painting career before health issues caused her to retire, Skerritt says. Her artwork reveals someone who is sensing “the end of their time on the planet and becoming one with the landscape.” To Scholl, West’s work was “a revelation.” The Marking the Infinite exhibition features the “last gigantic, monumental burst” of artwork before she retired. “Those paintings really take your breath away when you look at then,” he says. Artwork courtesy of the individual artists and the Frost Art Museum FIU.